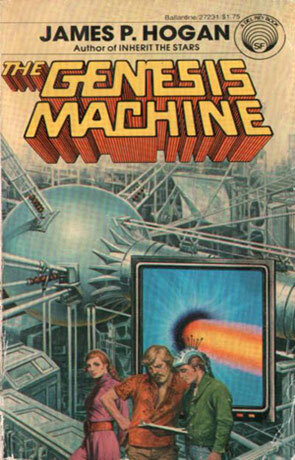 The Genesis Machine is a science fiction novel by James P Hogan. Written in 1978 and taking place a few of years from now, The Geneses Machine pretty much read as an alternative history story, even if it wasn't intended as such. In the future envisioned by Hogan the cold war has gotten a lot hotter and we are on the brink of a third world war. Not between the old superpowers but between the north (Russia teams up with the western powers of today) and the south (an African/Arabic fraction teams up with China). I wouldn't say that Hogan predicts the fall of the Soviet Empire, but it's a rather daring prediction that I wouldn't have expected from a book from the 1970. Times are bad and nearly all science is in the hands of the paranoid government, whose focus is on research the can be applied to the war machine. Basic research has nearly no founding unless it can show direct application to the war effort. In steps Clifford, brilliant young math-wiz with a theory that not only explains all the problems with the old theories, but also shows that the world as we know it, is only a part of something bigger. The book is mostly about the problems Clifford (and his friend Phillipsz) has with the government and about how they are forced to develop The-Evil-Bomb, when they finally get the government to finance them. Better characters than I had expected from Hogan and worth reading for the techno babble alone.